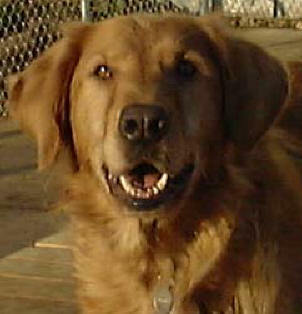 Mattie was a stray female Golden Retriever who was found wandering in a rural community and taken to the local shelter. No one knew who owned her, and all she had was a piece of clothesline around her neck. She was a sorry sight, very thin with a coat which was dull and balding around her ears and eyes, but the most shocking aspect of her appearance was a huge tumor flopping from a toe on one of her hind legs. 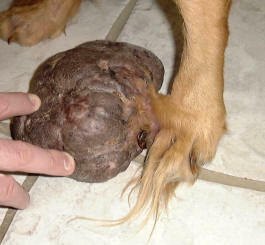 The tumor was about 7 inches in diameter and weighed over two pounds. Mattie was in such sad condition that the shelter was prepared to prosecute her owners for animal abuse, but the owners were nowhere to be found. Even though Mattie did not feel well, she had figured out the easiest way to walk was to swing her leg way out to the side as she went along. When she wanted to run, she would lift that leg up (holding all that weight up) and run on three legs. Through the efforts and support of the shelter and many people, Love a Golden Rescue was able to take Mattie and treat her. 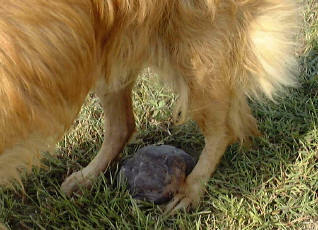 Our rescue's vet was able to remove the tumor successfully. 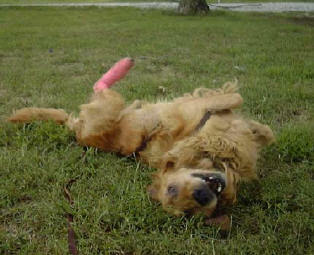 Mattie was so happy she rolled with joy the first time she was outside..
Fortunately the tumor was benign. Mattie also tested heartworm positive. The heartworms made her cough and made it hard to breathe. Mattie was treated for heartworms and successfully completed heartworm treatment and regained strength. Mattie enjoyed playing in the yard and so loved doing things outside. She began attending obedience class and was doing very well. We had hoped that she would have many happy years in an adoptive home, but that wasn't to be. 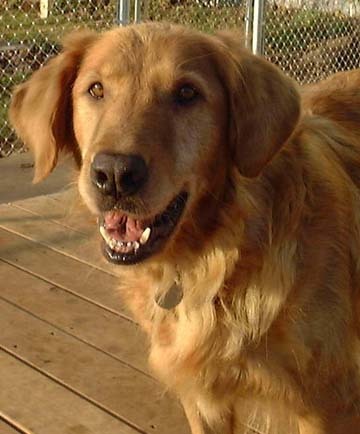 On January 22, 2002, Mattie started failing and passed away during the drive to the animal emergency clinic. We miss her and thank her for sharing part of her life with us and for reminding us about the importance of fighting the good fight. we have started The Mattie Fund to cover extraordinary vet expenses for veterinary care for Love A Golden rescue foster dogs who need heartworm treatment, surgery to remove tumors or for orthopedic problems, cancer treatment, and other veterinary treatments which go beyond the usual shots, neuter or spay, and heartworm testing. The Mattie Fund has been used to help pay for diagnostic tests and treatment at a veterinary specialist clinic for Kristy for her urinary incontinence. "We would like to thank the following for their generous contributions to The Mattie Fund"
We got Carmen from you 2 years ago and love her, She has been a wonderful dog! This Page was last updated on December 20, 2008 .